In a significant finding in the search for life beyond Earth, scientists from The University of Texas at Austin and elsewhere have discovered what appears to be a body of liquid water the volume of the North American Great Lakes locked inside the icy shell of Jupiter's moon Europa. 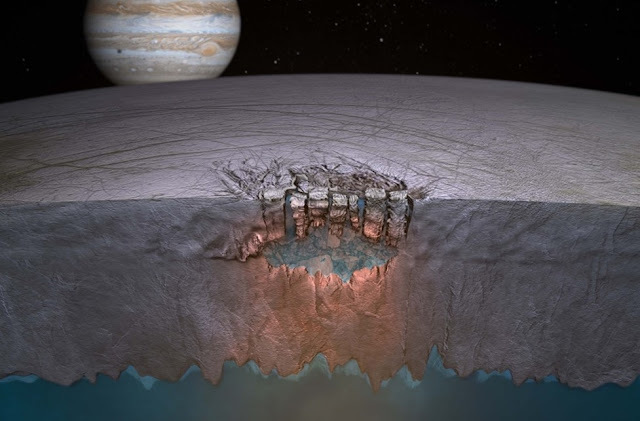 The water could represent a potential habitat for life, and many more such lakes might exist throughout the shallow regions of Europa's shell, lead author Britney Schmidt, a postdoctoral fellow at The University of Texas at Austin's Institute for Geophysics, writes in the journal Nature. Further increasing the potential for life, the newly discovered lake is covered by floating ice shelves that seem to be collapsing, providing a mechanism for transferring nutrients and energy between the surface and a vast ocean already inferred to exist below the thick ice shell. There is additional explanatory text at Physorg; artist's conception via the Washington Post. i wandered and found this while reading. I think the prehistoric shift of earth's poles is not just theoretical, but a fact well established through micromagnetic studies of rocks. But you'd have to look it up.